Children who are comfortable in their surroundings, happy in their play & confident in their learning. As a Christchurch-based mum, passionate early childhood educator, and keen researcher I had a vision to create a truly exceptional and unique learning space for children to learn, grow, discover and develop in a natural, home away from home setting. Our Nursery is a small, homely space designed for younger babies to explore and develop freely. We practice primary caregiving, so each baby has their own teacher who is available to meet their individual needs. 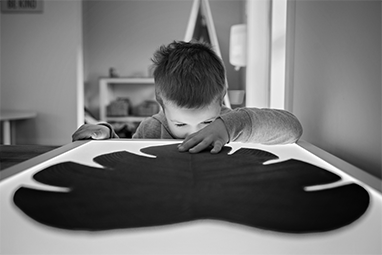 Our Preschool focuses on inquiry-based learning; the natural curiosity of young children is stimulated as they take an active role in the education process by exploring their environment to make inquiries and discoveries. Skilled teachers then guide this process in a way that supports the children’s own ideas and extends their learning. Little Blue Penguin values holistic development and places importance on a nurtured well-being in order for meaningful learning to take place. Interested in enrolling your child in our learning community? Quality preschools fill up fast. Contains everything you need to know. Includes information about our programme, environment, teachers, planning and meals. Also contains several helpful guides and instructions to help give your child the best experience possible. Teachers at Little Blue Penguin are caring professionals who are there to offer gentle, respectful guidance for children through quality, responsive interactions and a collaborative ‘community’ approach to teaching and learning.